I started running for my health and my two boys. In the Summer of 2010 my wife Shari and I were in the local park with the boys when my eldest, Micah (who was 3½ at the time) ran across the field and I was totally out of breath trying to keep up with him. I had recently changed jobs and there was a gym on the campus where I worked. I started with a ‘Couch to 5K’ program and did my first race over Thanksgiving (a 5 miler). In the process of running multiple times a week I lost about 60 pounds (between August 2010 to April 2011). My running has helped me maintain the weight loss since. I started running further and further and did my first half marathon in April 2011 (Bucks County Half) and the Broad Street Run 10 Miler (my first ‘Big’ race) in May 2011. The Philadelphia Broad Street Run is the biggest 10 mile road race in the USA. My father in law had run Broad Street many times and I wanted to give it a try myself. It was great. My goal (as a new runner) was to finish and also in the back of my mind was to break 90 minutes. I made my time goal…just. I ran 89:55. I had bought a copy of Runners World (January 2011 edition) which talked about the top rated Marathons. It had an article about the Philadelphia Marathon which is close to home (I live in Langhorne, Bucks County, PA about 35 minutes drive from Philadelphia). Then I saw that that the Runner’s World Challenge was coming to Philadelphia for the 2011 Marathon. That made up my mind to decide to a Marathon (it was on the ‘before I’m 40’ list which was approaching in 2012). I signed up and followed the training program from the website. During the marathon (I think mile 22 or so) my body started to realize that this was the furthest I had ever run before and all I could think about was that I was so close I have to finish for my boys. The best part of the day was that once I crossed the finish line my eldest son was there to meet me. We walked back to the hotel together very slowly. I finished in 4:06:48. The Thursday after the marathon, my wife, my father in law and I ran the Thanksgiving 5 miler together (which had been my first race the previous year. I bettered my 2010 time by 6 minutes (43:32) less than a week after running my first marathon. Now that my wife also had the running bug we decided to head to Walt Disney World for the 2012 Marathon weekend. My boys (Micah 5 and Asher 20 months at the time) ran the kids races, Shari ran the half marathon and I am ran the full finishing in 4:06:18 (beating my Philly time from 7 weeks earlier….again, just!). Now Shari and I run our races together…well almost. At 5’11” I am 1ft taller than Shari and I have longer legs but she is probably quicker and is usually very close to my time and mostly catches me up – plus she looks better running in a tutu! 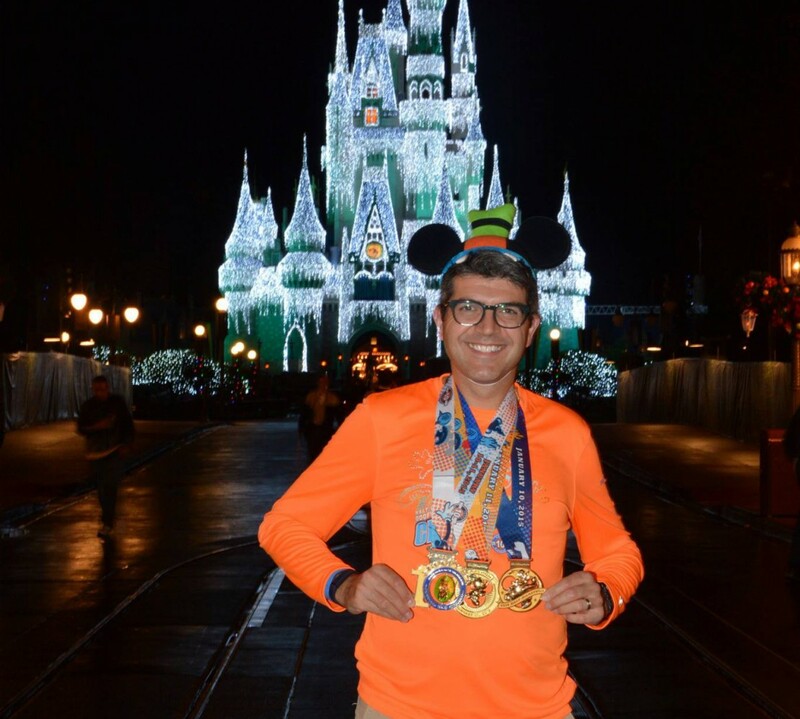 We returned to Walt Disney World in January 2013 where I ran the Goofy Challenge (in the process raising $3,400 for the charity ‘Autism Speaks’) and Shari ran her first full marathon. Click here to follow my progress.